One of my resolutions for 2010 is to get more enjoyment out of the things that I enjoy, if that makes any sense. Tonight I'll be doing that by seeing Alasdair Gray give a talk at the University of Glasgow. 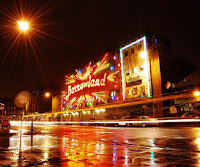 What are some of your favourite things in Glasgow? Seared scallops with black pudding and apple puree @ City Merchant...I wager my first born that you'll never find better. A cold stone concoction of my own invention at 3 Steps to Heaven on Cresswell, (it's vastly more cosy than it's sister store on Byres Rd). Lou's crazy daily banter! (owner and operator of Biblocafe on Woodlands)...and their incredible mediterranean vegetable and cheese baps, mmmmmmm. The buffet of free tasters @ Oil & Vinegar. Second hand books from Shelter on Great Western Rd, only 50p kiddies. Fratelli Sarti's on Bath Street. Eat in the front room only, you'll feel as if you're feasting in someones fairy light laden wine cellar. Polish off the experience with an off-the-menu affogato, it's monsterous! Seared scallops with black pudding and apple puree @ City Merchant...I wager my first born you'll never find better. A cold stone concotion of my own invention at 3 Steps to Heaven on cresswell, (it's vastly more cosy than it's sister store on Byres Rd).